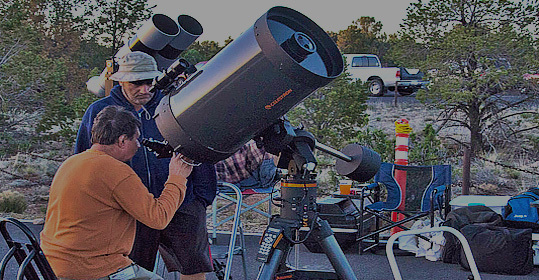 GRAND CANYON, Ariz. — The 27th annual Grand Canyon Star Party will be held June 17-24 at both the North Rim and South Rim of Grand Canyon National Park. Amateur astronomers from across the country will volunteer their telescopes and expertise for the enjoyment of park visitors. Free slide programs will be presented, and numerous telescopes will offer views of planets Jupiter, Saturn and Mars, as well as double stars, star clusters, nebulae and distant galaxies – and the Moon, later in the week. By day, keep an eye out for solar telescopes pointed at the sun. National parks such as Grand Canyon are protective havens for some of the last remaining dark skies in this country. Last year, Grand Canyon National Park announced its Provisional International Dark Sky Park status through the International Dark-Sky Association. This provisional status gives the park three years to retrofit two-thirds of the lights in the park to be night-sky friendly. In 2016, 43 percent of the lights in the park were night-sky friendly. This year, the park is celebrating continuing efforts to preserve this precious dark sky sanctuary while counting down to both Grand Canyon National Park’s 100th birthday and full International Dark Sky Park status in 2019. On the North Rim, telescopes will be set up on the terrace of the Grand Canyon Lodge every evening. Astronomers will also use green lasers to point out constellations. An astronomy slide show will be presented at 8:30 p.m. nightly in the lodge auditorium. By day, look for solar telescopes on the terrace and elsewhere. Check the Visitor Center and park bulletin boards for program topics and additional details. Nighttime temperatures on both rims can be quite cool, even in summer. Those attending the Grand Canyon Star Party are encouraged to bring warm layers of clothing. When traveling in the park on the South Rim, it is best to find a parking space and use the free shuttle bus system to access points of interest in the Grand Canyon Village area. On the South Rim, events include a nightly slide show at 8 p.m. in the Grand Canyon Visitor Center Theater, followed by free telescope viewing behind the building. To guarantee a seat at the slide show, arrive early; doors open at 7:40 p.m. Green-laser Constellation Tours will be offered at 9, 9:30 and 10 p.m.
Telescope viewing is best after 9 p.m. and continues well into the night. Visitors may arrive any time after dark. A flashlight is recommended for the walk to the viewing area, but white lights are not permitted on the Telescope Lot. Give your eyes time to dark-adapt, or use a red flashlight, easily made by covering any flashlight with red cellophane, nail polish or permanent marker. Parking is available in Lots 1 through 4 (Lot 4 is accessible), or arrive by the free shuttle bus, which runs until 11 p.m. This event is sponsored by the National Park Service, the Tucson Amateur Astronomy Association (South Rim) and the Saguaro Astronomy Club of Phoenix (North Rim), with funding from Grand Canyon Association and in partnership with the International Dark-Sky Association.